Two architects explore new uses for familiar materials in three ingenious kitchens. Arjun Desai and Kathy Chia, the husband-and-wife team behind Desai/Chia Architecture, treat every space like a laboratory experiment. Perhaps it’s a carryover from their time as graduate students at the Massachusetts Institute of Technology, where they met in an architecture program known for its inventive use of materials. The three Manhattan kitchens featured here, including the one in their own home, show their creativity with high-tech elements like Corian and anodized aluminum. Created for a family that likes to entertain, this kitchen includes a 24-foot-long, stainless steel-topped ash island that has seating for eight and houses two sinks and dishwashers and a Wolf cooktop. Sliding doors cover rear cabinets with an additional 15 feet of storage and counter space. The upper shelves are deep at 14 inches, accommodating serving platters. The ash backsplash also includes TV and computer hookups. Undercounter fixtures, combined with recessed ceiling cans and uplighting above the cabinets, brighten the space. The company PK-30 System embedded matte anodized aluminum between translucent resin panels to create an effect reminiscent of a Japanese shoji screen (212-473-8050 or pk30system.com). Desai and Chia chose quartersawn ash because it is a lighter color and has a more even grain than maple. The stainless steel pulls from Sugatsune have a satin finish, which hides fingerprints (from $11; 800-562-5267 or sugatsune.com). Chia (above, with her kids) and Desai experimented with Corian in their kitchen, using the material not only for countertops, but for cabinet fronts, backsplashes and even the sinks. As parents of small children, they were attracted to its durability and easy maintenance; as designers they admired its beautiful finish and versatility. The result: an incredibly functional kitchen with integrated shelves and utensil holders that blend with the rest of the space. 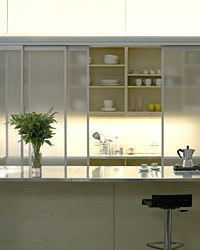 The white Corian has an almost luminous quality, so light bounces around and makes the kitchen feel larger. Prestained bamboo floors from Teragren, in espresso, are a dramatic contrast to the white Corian (from $6 a sq ft; 800-929-6333 or teragren.com). Desai and Chia had notches cut out of the Corian drawer fronts to serve as finger pulls for a cleaner look. A curvy design snakes across the front to visually connect them. The architects used fluorescent, incandescent and halogen lighting, a combination that Chia says mimics natural daylight. Inspired by bookshelf lighting at the Seattle Public Library, they installed energy-efficient fluorescent bulbs in the custom fixture over the sink. The ceiling fixtures are incandescent and two halogen units provide task lighting for the island. With little natural light in this kitchen, Desai/Chia incorporated reflective materials: stainless steel for the countertops, for example, and translucent glass in the sliding upper cabinet doors. The backsplash behind the stove is mirror-backed, acid-etched glass, which gives it a satin sheen similar to the anodized aluminum used on the range hood and lower cabinet fronts. "Glass is easier to keep clean than aluminum," Chia says, so it’s better for the stove backsplash. The ducts inside the air-conditioning units are painted plum, which is visible through the glass front panels and gives the space a warm splash of color. Recessed fixtures are installed in the soffit both inside and outside the sliding cabinets to spotlight the stored glassware. Desai/Chia used bridge-construction principles to create the extra-long nine-foot tabletop cantilevered off the island. It’s framed in steel and wrapped with a stainless steel skin. The architects chose matte anodized aluminum for the cabinets and custom cover around the Gaggenau Visor hood ($1,450; 877-442-4436 or gaggenau.com) and more durable stainless steel for the countertops. Desai/Chia Architecture, 212-366-9630 or desaichia.com.